Design of traditional and modern yachts, small commercial vessels and workboats. All our projects are designed in a full 3D CAD system, providing a clear view to the client and offering the possibility of his or her participation in the making of adaptations or changes before the actual construction starts. Surveys for the restoration and the dimensional survey of existing craft or wrecks for the construction of replica ships. Because of the revival of public interest in the construction of replicas or the restoration of existing historic(al) ships we decided to adapt state-of-the-art survey methods such as laser scanning and photogrammetry, used in industrial sites, for the building of a computer model of an existing vessel. This model can be used as a guidance or base for a completely new design or the construction of an exact replica. 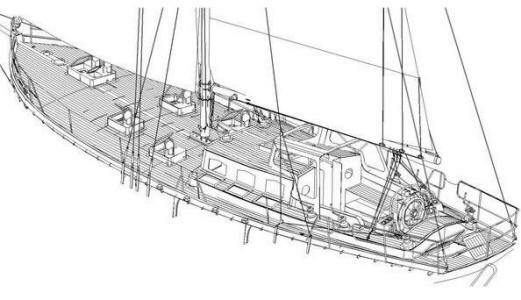 Wether it consists of the building of a new ship, the restoration or renovation of an existing vessel or any major repair job, the close follow-up with in dept knowledge in order to obtain the results you may expect is crucial. The composition of a good team of craftsmen, furnishers and advisors, together with the social skills to guide them as a team is the key to success. This can only be achieved by a close coordination and animated management. These time-consuming tasks can be completely or partly taken over by our organisation in order to make your project a succes.